My birthday this year fell on a Tuesday, which is kind of a lame day to have a birthday. I guess they all can’t fall on weekends. As generally happens to me this time of year, I had a lot of vacation time to use or lose in the month of June so I decided to take the Thursday before through my birthday off for an extended birthday celebration vacation. We already know what I did on Thursday. So what did I do with the rest of my time off? Friday did not start out nearly as fun as Thursday since along with this birthday came the need to renew my driver’s license in person. It could have been worse, but spending an hour at the MVA was not really the highlight of my vacation. I now have a new license that doesn’t expire for 8 years, so hooray for that. Friday afternoon I treated myself to a matinee of Before Midnight. I adored the first two movies in the series, Before Sunrise and Before Sunset, and had been eagerly awaiting Before Midnight. Due to the fact that I am an inferior being deigns to live outside of New York City or Los Angeles I have been denied this pleasure prior to this weekend. The movie opened in limited release in NYC and LA over Memorial Day weekend, while the rest of us had to wait. The ends of both previous movies are ambiguous leaving you not knowing what will happen in the future of Jesse and Celine’s relationship or whether they will have one. Although you find out in the first five minutes of Before Midnight, I really wanted to go into the movie unspoiled with no knowledge of how things might have progressed between the characters over the past 9 years. I did heroically avoid to find out anything about the movie through constant vigilance. It meant a dodging a lot of reviews about the movie the weekend it opened as well as movie and radio ads leading up to its wide release. This did result several times in the rather dignified practice of closing my eyes, covering my ears, and shouting lalalalala really loudly until the ads were over. Even though it ultimately probably doesn’t mean anything to your actual viewing of the movie I will not get into specifics in case anyone else reading this hasn’t seen it yet and also prefers to go into it unspoiled. I will say that I loved it and it felt like the perfect place for these characters to be in 9 years after we last saw them. If you liked the first two movies you’ll like this one too. Friday night was spent at the Orioles/Red Sox game with my husband and 4 of my friends. Though I was wearing a Red Sox shirt, I was kind of agnostic about who won. I was a Red Sox fan first, but the Os have been my hometown team for going on 13 years now. Also I mostly really don’t care about baseball, I just enjoy sitting outside at a game and eating bad for me stadium food. The Os wound up winning in a nice double play at the end. 95% of the games I’ve been to in the past have been Red Sox games and usually those games at Camden Yards feel more like a home game for the Sox since there are so many Sox fans there. For the first time the stadium was mostly a sea of orange so good for the Os I guess. Seems like people haven’t abandoned all hope from the season they had last year yet. The weather for the game was gorgeous. It was the perfect night to be out at a game. Plus there were post game fireworks that were very cool. Lots of varieties I’ve never seen before. 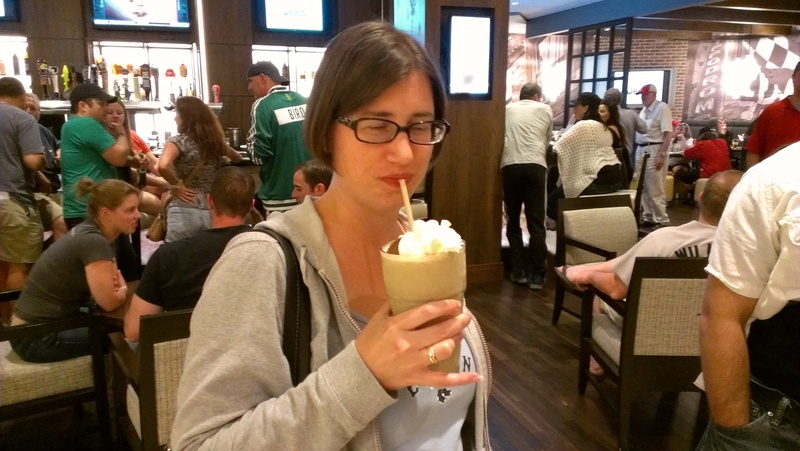 A few days before the game my friend Alison came across this article in the Baltimore Sun about the Sweet Baby Jesus milkshake, which is a milkshake made with Sweet Baby Jesus porter, Sloop Betty Vodka, and Kahlua, being made at the bar inside the Marriott hotel by Camden Yards. Naturally we decided it was necessary to try such a concoction, so headed over after the game to try one. We sent our friend Darra to do the dirty work of ordering the crazy thing since the bar was super crowded with people coming in after the game and we knew the bartenders would hate anyone ordering such a ridiculous drink even if it is on their menu. Darra is someone who doesn’t mind pushing her way to a bar and being a PIA. I’m sure the bartenders hated us even more after a number of people saw the drink and asked what in the world it was. We saw a couple of others being made after that. It was actually quite delicious despite the fact that the concept of a beer milkshake sounds pretty nasty. A not very good picture of me enjoying the milkshake.